Once you open a frequencies specification file or dictionary file, you will be presented with a list of items (variable) described by the dictionary. (If you open a frequencies specification file, the frequencies specification file specifies the dictionary being used.) To select an item for a frequency distribution, click on the tickmark. The tickmark will show for selected items. Clicking on a selected item will deselect that item. In the image below, the user requested the frequency distribution for "Age in 5 year groups" by clicking on the "Age in 5 year groups" value set. From the View menu, select Names in Tree; or press Ctrl+T, to switch between item labels and item names in the selection tree and in the tabulation report. Choosing an item automatically selects all lower level items contained within that item. For example, choosing "Person Record" will select all fields and value sets in the person record; choosing the field "Age" will select all the value sets for age. Deselecting an item will automatically deselect all lower level items contained within that item. 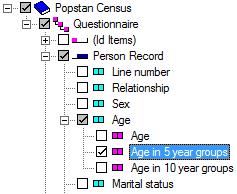 For example, deselecting "Person Record" will deselect all fields and value sets in the population record; deselecting the field "Age" will deselect all the value sets for age. Clicking a selected item will deselect it and all lower level items contained within that item. If you selected a group of items by selecting the parent item, you can deselect the individual child items by clicking on the tickmark for that child item. If all items contained within a parent item are selected, the tickmark or the parent item will have a white background. If some, but not all of the items contained within a parent item are selected, the tickmark of the parent item will have a gray background.